Figure 1. 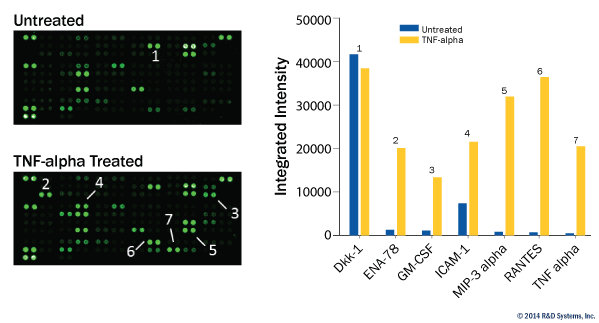 The Human XL Cytokine Array detects multiple analytes in cell culture supernates. HUVEC human umbilical vein endothelial cells were untreated or treated with 100 μg/mL recombinant human TNF-alpha (R&D Systems, Catalog # 210-TA) for 24 hours In each array shown, 500 µL of cell supernate was used. Array images were collected and analyzed using the LI-COR Odyssey Infrared Imaging System. Figure 2. 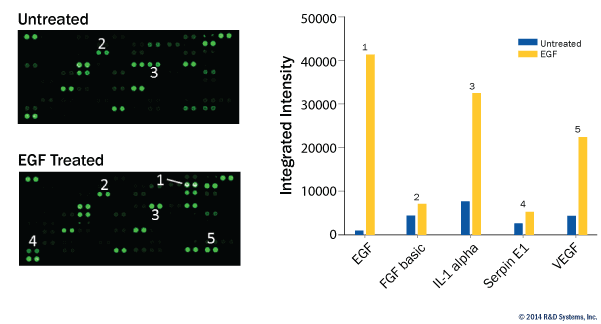 The Human XL Cytokine Array detects multiple analytes in cell culture lysates. A431 human epithelial carcinoma cells were either left untreated or treated with 50 ng/mL of recombinant human EGF (R&D Systems, Catalog # 236-EG) for 24 hours. 200 μg of cell lysate was run on each array. Array images were collected and analyzed using the LI-COR Odyssey Infrared Imaging System. Figure 3. 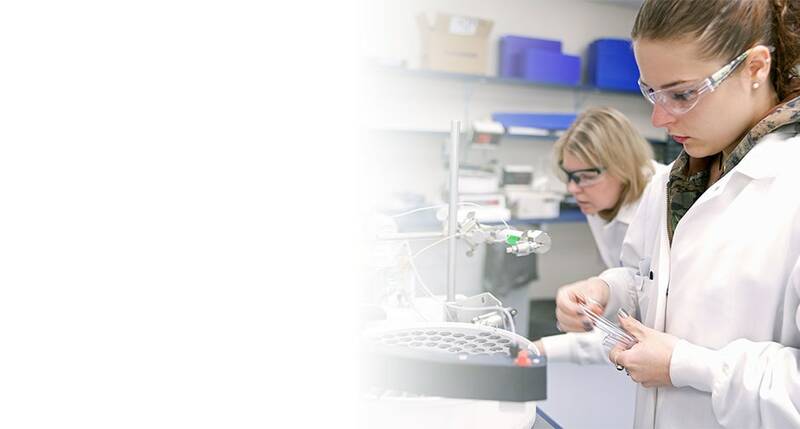 The Human XL Cytokine Array detects multiple analytes in tissue lysates, PBMC supernates, serum, milk, urine and saliva samples.